Thanks to Netflix’s I have a bad habit of binge-watching TV shows. Sometimes I binge-watch two shows at once. One such binge left me watching Buffy the Vampire Slayer and House M.D. on Netflix for about a month. It’s always enjoyable to re-watch shows I loved from my first viewing until the end. I didn’t re-watch them simply because I want to experience the same feelings and see the same things as I did the first time because I wasn’t sure I would. Why you asked? Because I’m not the same person I once was. I’m older, which means I’m hopefully more mature (though sometimes that is up for debate) and I’ve been studying film theory and criticism (at the master’s degree level) for several years now. So I look at some of the finer details of cinematography and story making. Buffy aired in 1997 (before I was even in high school) and came to its conclusion in 2003 (just as I was completing my first year of college). I was in college when I started watching Buffy which puts me close to the same age group as the main characters. House started a year after Buffy came to a close, in 2004, and ended in 2012. When I started watching House around 2008 (if I had to guess), I was defiantly younger than the main characters, and possibly still am.However, I am no longer the same age as Buffy and the gang, but I’m still younger than House and Wilson. I’m trapped in between the groups unable to easily identify with either main character due to age proximity. Re-watching the shows again allowed me to see certain scenes or episodes again, that I loved. I have always loved Buffy the Vampire Slayer’s episode “Hush”, in this episode everyone in town has had their voice stolen, and The Gentlemen are stealing hearts. The whole episode feels like one of those old silent films but has all the horror of a present-day supernatural flick. A few years ago I was privileged enough to meet and interview one of The Gentlemen (Camden Toy). It was the closest I’ve ever come to fangirling out, and Camden Toy, the wonderful man he is, took it all in stride. I really enjoy watching House, M.D.’s episode “Broken.” In these two episodes, House is in a Psychiatric Hospital to kick his Vicodin habit and to work on a few personal problems. In these episodes, we get to learn a lot about House, which I find very exciting. We get to watch him grow and we, of course, get to watch him be a jerk. In these episodes, the actors perform brilliantly, and Hugh Laurie shows us how House is truly a three-dimensional character. However, this time around I noticed things I didn’t notice before, and occasionally saw episodes I didn’t see the first time around. For example in “Hush”, this was my third or fourth time seeing this episode (okay maybe more). Halfway through the episode the film cuts out most modern shooting as far as effects (both lighting and sound) and setting (the cars the streetlights) look and sound as if they were shot sometime between 1920 and 1960 when films became more about the dialogue and less about the action. The real way to date the show was the color and the clothing worn by the Scooby Gang. The shots were also longer, to help show what was going on and help build suspense. Most of these things I didn’t realize when I first watched the episode because I had not yet studied film. Going back through House, I realized there were several episodes that I had not seen before. So it was a treat to learn a little more about the characters and how the overarching storyline was progressing. This time around the overarching story flowed a lot better and I was better able to understand why characters reacted to certain situations the way they did. With House, it is also fun to see all the episodes, because sometimes you miss a guest actor or actress that you thoroughly enjoy. Last week I was browsing the movie options on Netflix’s (as I often do in the evening) and I came across Today’s Special (David Kaplan, 2009). Due to the size of my TV screen, the distance away from the screen, and my poor eyesight I could not read the brief description that Netflix’s provides. But I saw that it had 4.5 to 5 stars and from the picture could tell that it had to do with cooking. If you know me or anyone in my family – and even if you don’t (you will now) – you know the famous quote, “foods a really big deal in this house.” Everyone in my family cooks, and we have all worked in a restaurant at some point in time in our lives. So stumbling across a food related comedy, that I hadn’t seen, for me, was very exciting. Once I found it, I knew what my night would look like; I would be glued to the couch with tea, snacks, and because it’s winter in Norther Michigan… blankets. I am happy to report I most definitely agree with Netflix’s star rating when it comes to this film, I thoroughly enjoyed Today’s Special! As Ebert mentions in his review of the film in 2010, the story arch is old and predictable, but the cast does a wonderful job sucking you into the world that was created. The film opens in a high-class restaurant kitchen, where Samir is the sous chef. Though Samir believes he should become the chef at the new restaurant which is being opened by his boss, he is passed over and the chef position is given to a young cook, with far less experience. Because Samir is so upset with the decision, he quits his job and says he has been offered an internship in Paris. Due to a family medical emergency Samir never gets to Paris. Instead, he has to move back into his parent’s house and take over the family restaurant. Taking over the family restaurant is not and easy task. There is a lot to do, and in his time of need, Samir turns to a former chef turned cab driver, Akbar. With Akbar’s help, Samir is able to turn the fate of his family restaurant around and repair his families strained relationship, brought on by generational clashes. By the end of the film much to the delight of Samir’s parents, Samir also finds love. As I said, the story is totally predictable, it is a feel-good tale of self-discovery. However, for some reason, I remained enthralled by the film. One reason for this could have been the fact that Samir and his family are Indian and I absolutely adore Indian cuisine, because of its spectacular flavor. It is odd to learn that Samir has never cooked a traditional Indian meal. And thus has to hire a cab driver to teach him how to make garam masala. A process that Samir doesn’t get down until towards the end of the film when everything is left on his shoulders. Throughout Today’s Special Akbar serves as a sensei, teaching Samir more than how to cook an outstanding garam masala. (Note: I tend to cook without recipes too. So when Akbar says Indian cooking is all about heart (passion) and improvisation, I couldn’t help but smile.) As I am a fan of anthropology I also like how Samir’s Indian culture is woven into the film. It is uplifting to see Samir embrace his heritage and wake his father up so they can do morning prayer. As I am a fan of anthropology I also like how Samir’s Indian culture is woven into the film. It is uplifting to see Samir embrace his heritage and wake his father up so they can do morning prayer, in traditional prayer attire. Watching Akbar, Samir, Carrie (an old co-worker and Samir’s romantic interest) and some of the restaurant’s regulars share a traditional home cooked meal is fantastic! The group shares stories, laughs, dances to traditional Indian music, and eats scrumptious looking Indian cuisine.At Akbar’s dinner, Samir teaches Carrie how to eat the traditional Indian was, with three fingers. This event only lasts a few seconds, but not only does it show the closeness between Samir and Carrie, but it also shows Samir embracing his culture and teaching Carrie to do that same. The colors that are in Akbar’s apartment scream Indian to me; reds, yellows, oranges, and gold are prominent and there are hints of blue and green. I love color! It adds life to a room, and different colors draw out different emotions. The reds, yellows, and oranges are like spices used in Indian cuisine, that add life, and pizzazz. The last thing that draws me into a film is the little things. Interactions between characters no matter how small, if they show a character’s personality or two characters relationship, I am intrigued. I’m a people person, I like interpersonal communication and character driven stories. Today’s Special is very character driven. It is all about Samir and his journey from sous chef at a French restaurant to owner and chef at his own Indian restaurant. One of my favorite funny little moments is when Samir first returns to his parent’s house and he tries to call Carrie from the bathroom. He is hiding there in hopes of getting privacy, but his mother keeps asking him questions, some of which make Samir and the audience feel very awkward. At the beginning of the film Samir is very distant from his family, but through the course of the movie the grow closer. It is both a sad and joyous occasion when Samir finds old family photographs and decides to frame them and put them on display. The montage which showcases the Tandoori Palace’s rebirth and the growth in the relationship between Samir and Carrie is sweet, cute, and funny even though it is overused. Then again I could be partial to the addition of couple painting on the floor with Carrie’s toddler. Lastly, the name of the film, I personally think is brilliant! It ties into films theme very well. And it picks up on one of the little things, that helped me fall in love with the film. So if you are a foodie, like comedies, or binge on feel-good movies to combat the winter blues, please, check out Today’s Special. If you still aren’t sure this film is a good fit for you, check out Today’s Special Trailer. Maybe that will intrigue you more than my positive review. The film takes place during the roaring 20s, well before Harry Potter. Cinematically speaking Fantastic Beasts is breathtaking! We are put in a world that is whimsical and classic, that occasionally shows the seedy underbelly that we’ve heard about it our history lessons. Seeing New York City in the late 1920’s was great fun, buildings are getting taller and more majestic. And when we first get a glimpse into MACUSA (The Magical Congress of the United States of America) it is truly a site to behold: with shinning black, gold and white marble; moving golden statues; and golden clocks that tick as wizards and witches hurry about their day. Some of the offices at the MACUSA are dimly light and cramped, which brings an interesting contrast after seeing such a bright and majestic foyer. Fantastic Beasts is truly a story for everyone. During the two hours and 20 minutes of this film, there is adventure, comedy, and romance. Newt Scamander (Eddie Redmayne) -an ex-Hogwarts student- and his suitcase of extraordinary creatures arrive in New York City. No sooner than Newt gets downtown one of the precocious inhabitances of the case escapes. During Newt’s comical attempted capture of the creature, he meets a No-Maj (muggle) named Jacob Kowalski (Dan Fogler). Through a series of events, most of which are funny, Kowalski ends up with Newts suitcase. Once back at his home Kowalski opens the case and some of the beasts’ escape. Causing destruction and mayhem on New York City. Seeing one of the creatures escape ex-Auror, Tina Goldstein (Katherine Waterston), follows the men in attempts to capture Newt and the creatures, hoping to regain her Auror status. The trio is soon joined by Tina’s sister, Queenie (Alison Sudol). As the quartet runs around New York, chasing after fantastical creatures, friendships and romantic interests form. Eddie’s performance as Newt is fun. He got to play comedic and brave hero. My sister and I laughed several times as Newt performed silly dances or did bizarre things, to coax the beasts back towards the suitcase. Dan’s performance as Jacob was defiantly more comedic that Eddie’s; but he did play the bumbling, non-magical, side-sick. Tina and Queenie are both intelligent and spunky; though they do have different ambitions. Both ladies are integral in tracking down the creatures and helping stop evil in New York City. There are serval other noteworthy appearances in Fantastic Beasts, but I don’t want to give them away. So just watch and enjoy the brilliant performances yourself. The creatures inside (and the ones that escape) Newt’s suitcase, are truly magical! The variety of creatures Newt manages to house inside the small suitcase is incredible. In the suitcase, there are creatures of all shapes and sizes from all over the world; and Newt has a habitat for each and every one of the creatures. There are deserts, rainforests, mountains, plains, and even a snow-covered hill-side. The colors for the creatures and their habitats are amazing, with almost every color in the color spectrum. Of course, some of the creatures have more neutral color tones, but there are a few with brilliant blues, gemstone greens, and royal purples. Drive the entire length of Route 1. That’s right folks, I wanna drive from Maine to Key West. Stopping along the way whenever I find a cute little town or nice bit of scenery. Why cute towns you say? For one, I’m more comfortable in small towns (remember I grew up in one). Secondly, they are highly photogenic and wonderfully relaxing. Go to Colorado and Montana. While there I want to go snowboarding and hiking. And I’m sure there are some amazing landscape and wildlife photographic moments waiting. Go to Kauai. I loved my time on Maui, and I really want to hit up another Hawaiian Island. My cousin lived there for a while, and my aunt and uncle thought it was amazing! It is the oldest of the Hawaiian islands, which alone makes its a must see for this history and culture buff. The amazing tropical scenery is also calling my name… think of all the stunning pictures of water and coastlines, rainforests, and mountains. (If we still used film, I’m sure I’d fill dozens of rolls. And I’m sure I’ll end up maxing out the memory on my SD card.) I want to hike, bike, and swim for weeks on end. On a related, but slightly different note, I am going to Sudan and Marocco in February/March 2016. I’m going to see where my parents live and take a family vacation. I’m super excited! When I get into Sudan we will be heading to the Nile for a cruise and then it’s off to Casablanca… where anything could happen. Two nights ago, after about a year of saying I wanna see that, I watched The Secret Life of Walter Mitty. I know it only got okay reviews, but absolutely loved it! Yes, it had its goofy/bizarre moments, but tell me you don’t daydream about having superpowers or being able to get whatever you want. (Oh, and if you do tell me you don’t daydream I wont believe you. Your daydreams might not be as fantastical as Mitty’s, but they still exist). I am always relieved when I watch a big budget Hollywood film and it doesn’t fit into the mold. Part of why I like this film is because it doesn’t fit into the mold of current Hollywood films (it’s not a super-hero film nor is it about some heroic man), it is as, A.O. Scott states dreamy and melancholy. Mitty a photo negative asset manager a LIFE magazine, is always daydreaming about things he wants to do. I too am a daydreamer, so relating to Mitty is easy. Mitty is a cog in the LIFE wheel (and in his own life, nothing excites him and nothing seems to give him much joy), who longs to break out, and eventually he does (hopefully I can too). Ebiri and Morgenstern say because of all the fantastical daydreams Mitty has, and that because Mitty’s great adventure is kicked off by a daydream, it is hard to get the audience out of that daydream mode and actually worry about Mitty, when danger finds him. Well Ebiri and Morgenstern, you’re wrong! There is a clear distinction between Mitty’s daydream of Cheryl, pushing him forward, and being circled by the shark in the ocean. Were you paying attention to the several minutes of water-scapes? And did you miss that fact that Mitty told the pilot he wasn’t okay. If those two things didn’t separate the dream from reality, this should help. Mitty jumped out of the wrong side of the helicopter, right into the cold turbulent ocean. If it were a daydream, he would have heroically jumped into the boat, the pilot would have given him and thumbs up and the boat crew would be cheering. Once Mitty finally breaks out of his humdrum life, which I for one would very much like to do. Morgenstern calls his adventures preposterous. And while a few of the adventures are unlikely, not all of them are. We have already established that Mitty knows how to skateboard, so long-boarding down the side of a mountain isn’t impossible. (Yes, it is unlikely that you would so narrowly escape a volcanic eruption. But it’s not like many people can fly or change into a raging green monster.) Nor is it impossible to hike the Himalayas or in front of a waterfall. Most of the adventures Mitty went on may not be common, but at least half of them are things I would be willing to do. I do in fact realize that I stink at updating this blog! Sorry guys and gals. Its not for lack of ideas, I can come up with at least two ideas a weeks (if not more). I could probably list half a dozen excuses as to why I don’t up date regularly… but when it comes down to it, I just don’t force myself too. I know when I say force, it sounds negative, like I don’t enjoy writing (which is far from true). So lets scratch force and say, I don’t make it a priority to sit down and write. Which is silly considering I want to make a living on my writing. I also know I have on several occasions said I would write more, and I do better for a time… before I fall off the face of the earth. My hope is that things will start progressing and I will make more frequent updates. If I don’t feel free to call me out and tell me to write something. In the last two or three weeks I started another blog, about traveling. The idea is that that TravelDiaryOnline will help jettison me into the life of a digital nomad. Don’t worry I still plan on writing about TV, films, and other nerdy things here. But hopefully managing two blogs, one of which will hopefully make me money in the next year or so, I will write more frequently. For no particular reason, other than I loved these two ladies. Back in 2009, my friend Anna Hovet started her own clothing line, that I absolutely adore! I got hooked on her clothing designs in 2007 she came out with her domestic violence collection, her senior project in Fashion Design at SAIC. Anna Hovet’s designs are unique,trendy, and super comfortable (she uses, jersey, fleece, and bamboo). Her clothing has designer style and streetwise comfort. Anna’s designs come in a variety of colors, that are generally vibrant, though she does use more muted colors from time to time. Whenever I wear something she made I get complements on the color and design. To which I always smile and say thanks, and tell them my friend Anna (a fashion designer in Chicago) made it. If you aren’t familiar with her clothing, you should be. Anna Hovet Designs, I cannot wait for your 2015 spring/summer collection! In January 2014 I made my first trip to California. 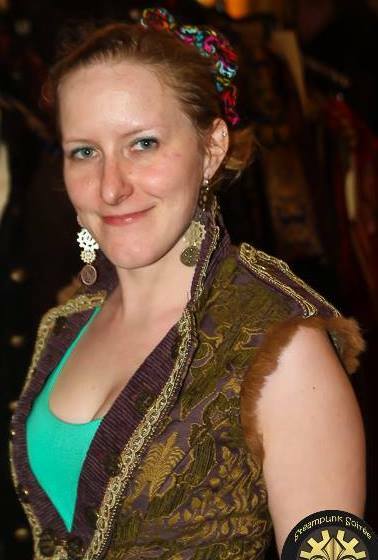 There I met Samiah Hinton (another fashion designer), at Her Royal Majesty’s Steampunk Symposium. Samiah Fine Clothing is a unique line of clothing that is modeled after the Victorian and Renaissance time periods. Samiah started her business in 1998, at that time she mostly made brocade jackets and coats. Now a days she creates fully custom fitted outfits, to go with her amazing jackets and coats. Samiah has a coat and vest that I am absolutely dying to have, both are stylish, warm, and make me feel like I belong in a fairy tale. Samiah Fine Clothing, congratulations on getting your line featured on the cover of front cover of Avant Garde Magazine!